Image Transfer Review: Just as is the case with companion piece Flags of Our Fathers, the picture is completely desaturated of color. The detail and texture are excellent, particularly on uniforms and caps. The shadow detail is excellent, for once the battle begins the action is almost entirely set underground in caves, or outside at night. There's no sign of the edge enhancement that afflicts Flags. It's quite a satisfactory transfer, which makes for a substantial improvement over the standard version on the flip side. Audio Transfer Review: The Japanese audio track is available in both DD+ 5.1 and TrueHD. While the former is plenty impressive, the TrueHD takes the combat sequences to an entirely different level. Bullets whistle past, explosions occur on every side with enormous, intense bass, and there's no noise or hiss of any kind. It's a clean and highly effective track that is totally immersive and frequently terrifying. It's becoming tautologous that TrueHD soundtracks are excellent, but this one moves right to the head of the class. Extras Review: The making-of documentaries and featurette are all presented in HD, while the premiere, press conference and, oddly enough, the trailer are presented in SD. 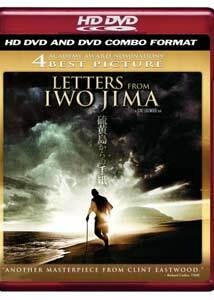 Aside from some trailers, all the extras are on the second disc of this set, starting with Red Sun, Black Sand: The Making of Letters from Iwo Jima (20m:58s), which features interview footage with Eastwood, producer Robert Lorenz, screenwriters Paul Haggis and Iris Yamashita, and production designer James Murukami, among others. They discuss this project growing out of Flags, and go over the evolution of the project. The Faces of Combat: The Cast of Letters from Iwo Jima (18m:35s) actually focuses more on the casting directors than the actors themselves, with the bilingual challenge being in the forefront. Images from the Front Lines: The Photography of Letters from Iwo Jima (03m:24s) is simply a montage of stills, and two pieces from the film's world premiere in Tokyo round out the package. First it's opening night (16m:06s), with Eastwood walking the red carpet with his interpreter, and an appearance on stage by members of the cast and the production team; and later at a press conference (24m:26s), the audacity of Eastwood's undertaking is the principal topic of conversation. The other side of the story is told in grand style by Eastwood,and the HD DVD serves up both the video and audio in equally impressive fashion.